The jagged blast of high explosives rips through the evening air. In the sky over East London the searchlights criss-cross in search of the enemy. On the first night of the Blitz, a corpse is discovered in a van in the back streets of West Ham. Detective Inspector John Jago recognizes the dead man as local Justice of the Peace Charles Villiers. But then a German bomb obliterates all evidence. Villiers, not a popular man, was both powerful and feared. As the sirens wail, the detective must start matching motive to opportunity – and it doesn’t help when his boss foists an intrusive American journalist on him. 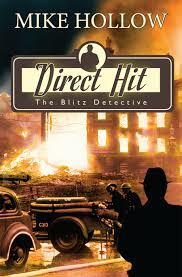 Jago soon discovers the dead man held many secrets, some reaching back to World War I. A lot of people wished Villiers dead – and an air raid is a good time to conceal a murder. My favorite part of this story was the time period. I absolutely love the WWII era. The author has a way of making you feel like you are in the story. There were some interesting discussions about God, truth and chance, though it seems Jago isn't about what he believes. There were a few time the word, "damn," appears, and I do feel that the book would have been just as great had they not been in the book, but other than that the book is clean. I would recommend this book to anyone who likes historical or mystery fiction.